Dimensions: Height 17.0 cm x Width 14.0 cm x Depth 14.0 cm. Introducing a product so enchanting, so mesmerizing, and so sublimely beautiful, its presence in your home will reverberate across time and space. Dubbed “the new lava lamp,” the Starcube is a three-dimensional LED cube that can render hour after hour of engrossing LED patterns, or illuminate a room with softly glowing mood lighting that’s fit for any occasion. The Starcube’s beauty is attributable to its intricate design. Each of these 3D LED cubes is hand-built and contains 1024 RGB LEDs, which are arrayed throughout the cube in order to create patterns and displays of awe-inspiring complexity. When you purchase this cube, you get 60 pre-programmed patterns, but those only scratch the surface of the Starcube’s capabilities. You can also insert an SD memory card and play animations of your own design, meaning that the entertainment and inspiration you can draw from your Starcube are virtually boundless. No other LED cube can match the features and versatility of the Starcube, and at 20.5 x 18.5 x 18.5 cm, the Starcube is more detailed than the 8 x 8 x 8 cm LED cubes commonly found on the market. 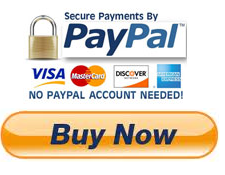 Purchase the Starcube now, so that you can start enjoying the next intergalactic sensation. Dimensions: Height 20.5 cm x Width 18.5 cm x Depth 18.5 cm. When you want to convert a room from just another place to sit into a place that you really want to be, there is no easier way to do it than by spicing up the lighting. And when it comes to interesting lighting, nothing outdoes the Starcube, a 3D LED cube that will totally remake any room in your house. If you haven’t already heard of the Starcube, then listen up, because you are going to want to hear this. The Starcube is a dynamic light display that is powered by a cube-shaped array of 1024 RGB LEDs (“light emitting diodes”). These diodes can flash a variety of colors, and when synchronized correctly, they create a dizzying variety of patterns and displays that will enchant you for hours on end, and then provide glowing illumination that will bring any room to life. The Starcube harkens back to the lava lamps that exploded onto the interior decorating scene in the early 1970s. Like a lava lamp, an LED cube is a beautiful hybrid: It provides both lighting and decoration. It can either illuminate the other things you are looking at, or it can be the center of attention. And when it’s the center of attention, the Starcube will captivate you for quite some time. It comes with 60 different display patterns pre-installed. The moment you take it out of the box, you can fire it up and begin watching one of these pre-programmed displays. And since truly appreciating all the intricacies of each display would take hours, it will be a very long time before you grow bored of the default programs--if you ever do. But in case you ever do want more variety from the Starcube, it comes with an SD card slot that accepts all standard SD memory cards. This means you can build your own display patterns for this LED cube, and then impress your friends and family with what you have created. 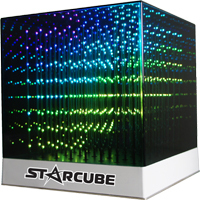 Those who are interested in making their own animations for an LED cube will find there is no better canvas for their creativity than the Starcube. Other cubes commonly sold on the market are much smaller, meaning they give less room for you to design your own patterns and diode displays. For instance, most build-it-yourself LED cube kits produce a cube that is 8 x 8 x 8 512 LEDs. The Starcube, however, is 20.5 x 18.5 x 18.5 centimeters with 1024 LEDs, which means that by detail, it is much more detailed than an 8 x 8 x 8 cube. 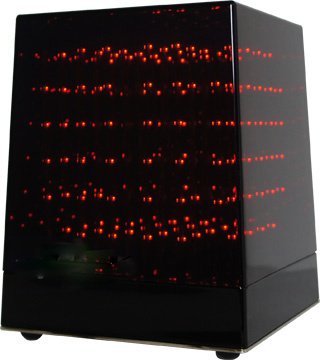 These extra LEDS means you can increase the complexity of the patterns your cube displays. You can be more creative, and anyone who sees the cube in action will be much more impressed. 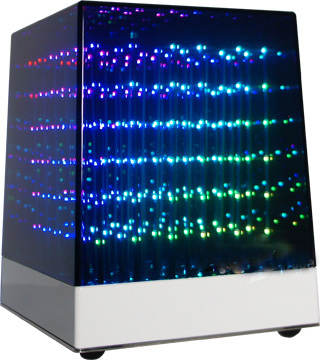 The Starcube is an ideal gift for anybody who is interested in electronics, light displays, programming, or high-tech decor. And what really distinguishes this LED cube from all of its competition is that it’s ready to go the moment you take it out of the box. Other cubes require people to assemble them piece by piece, which is a slow and painstaking process. And not only is assembly time consuming, but even worse, it means you have to wait even longer before enjoying the sublime beauty of your new LED cube. Save yourself the long hours, and purchase a cube that will be ready to use the moment you bring it into your house. 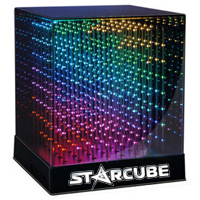 If you want an LED cube that will mesmerize you for hours, but won’t require hours of assembly or setup, then the Starcube is exactly what you’re looking for.